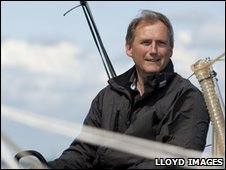 Cornish-based sailor Pete Goss has announced he will return to solo ocean racing in October's Route de Rhum transatlantic race. The 48-year-old will take on the race in a brand new Class 40 yacht named Concise 2. The Route de Rhum follows a 3,500-mile course from St Malo to Guadalupe. The last solo ocean race Goss entered was the 1996 Vendee Globe, after which he was awarded an MBE for rescuing French competitor Raphael Dinelli. Goss said: "It has been a few years since I have sailed such a fast, high-tech boat and the systems have come on leaps and bounds. "The competition will be tough, but I am going for a result and then looking forward to enjoying Guadalupe. "Despite all my miles at seas I have never sailed in the Caribbean and I just know I am going to love it." Over 60 yachts are expected to take part in the Route de Rhum which begins on Sunday, 31 October.